Jennifer Chacon poses during practice at Donna North High School Monday, Jan. 29, 2018, in Donna. Chacon, 18, who worked to provide for her family, has received a scholarship to attend Western Texas Collage. DONNA — High school senior Jennifer Chacon rarely misses a day of track practice, unless she’s working at J.C. Penney to help her family pay rent. The 18-year-old Donna North student now finds herself the recipient of financial assistance after being awarded a full scholarship to attend Western Texas College in Snyder, Texas, where Chacon will compete in girls track and cross-country. 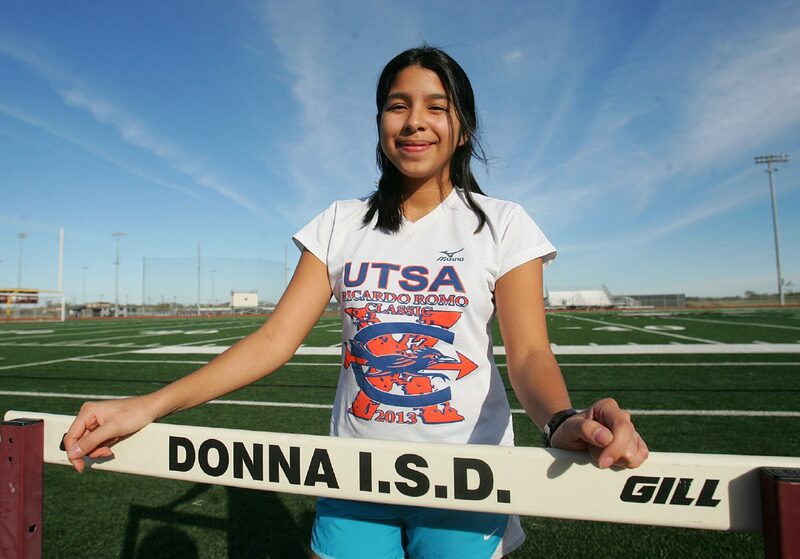 She’s the first from Donna North’s girls athletics programs to earn a track and cross-country scholarship. Chacon will be headed for a town located about 100 miles northeast of Midland, a long way from her family’s one-bedroom home. But she’s ready for the journey. 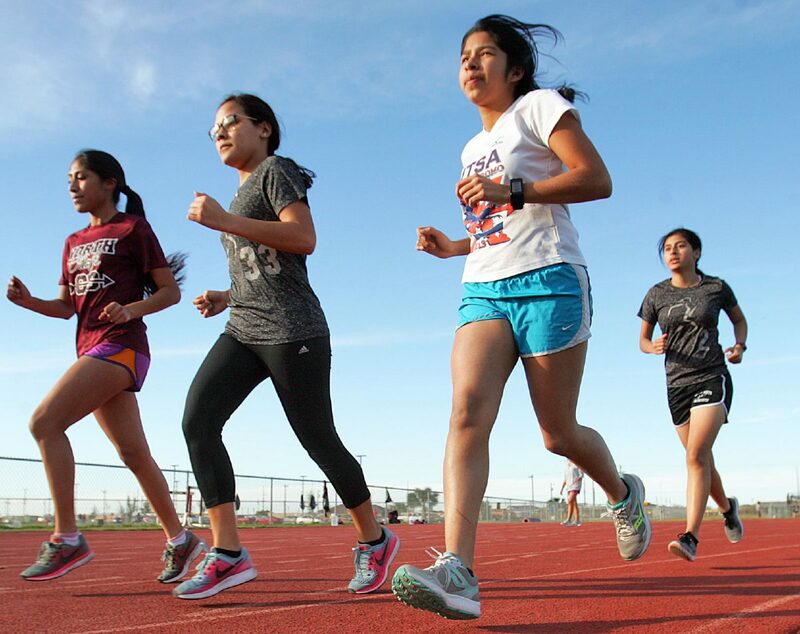 Jennifer Chacon, third from left, runs with the rest of the team at track practice at Donna North High School Monday, Jan. 29, 2018, in Donna. Her coach at Donna North, Roy Corpus, shared similar sentiments. “That was one of the proudest moments for me because Chacon was my first signing for (girls) track,” Corpus said. It’s not the only good news Chacon received this month. Her sister, Jaquelyne Chacon, who was diagnosed with leukemia last year, learned this month that cancer cells were no longer present. The 21-year-old still has a few more rounds of chemotherapy to complete all cycles necessary by May. “I’m not going to leave worried, and it’s going to be easier for me to adapt,” Jennifer Chacon said. She continues to work in an effort to help her big sister afford treatment as they still have an outstanding balance of about $6,000. The Chacons, however, are no stranger to adversity. Their father was deported in 2016 after federal agents showed up at their house near Donna, the sisters said. Though there were plenty of setbacks during high school, Chacon did not back down. “Running was kind of an escape from all the problems I had,” she said. Her dad would often joke that she was not allowed to leave the gates of their home, but now she will move more than 500 miles away from home to tackle another goal — this time competing at the college level. Interestingly, track and cross-country were not sports she originally considered joining in during high school. One of her two brothers, an eighth grader who is also in cross-country and track, will attend Donna North High School next year. While he runs on the same track as his sister, Chacon will be in Snyder studying accounting. She considered majoring in law enforcement or business. Once she completes two years at Western Texas College, she plans on moving on to a university. Until then, Chacon has her eyes set on making it to area, if not regionals in track. She’ll be running the 800 meter and the mile. “I know I have to set it up because college competition is something else,” Chacon said.